We like to think of our nutrition recommendations in terms of what you can have, as opposed to what you can’t. Even so, people inevitably start to think of their glass as half empty when they’re asked to scratch certain beverages off their shopping list in preparation for the Whole30®. No soda?! No cream and sugar in my coffee? No alcohol!?! What the heck will I drink?! Today, instead of “no” this or “no” that, try to think in terms of what drinks you can say yes! yes! yes! to. Like yes, I get to drink refreshing, herb-infused cucumber water and pretend I live at the spa 24-7. Or yes, there’s a chill in the air, the leaves are turning, and this steaming Snoopy mug full of bone broth is knitting me a warm, cozy sweater for my insides. There are a wide variety of nourishing, health-promoting, delicious beverages you can choose from on the Whole30, so right now, let’s look at what you can drink – nay, what you get to drink – when things like soda, alcohol, and creamer no longer have a home in your grocery cart. “What can I drink besides water?” is probably on our top ten list of Whole30 questions. A lot of people see water as boring and tasteless, but aside from being one of the three things you need to actually stay alive, water is a very versatile drink. Remember, you aren’t stuck with just the stuff from the tap! Make drinking water more exciting by creating a fancy-yet-simple spa-like concoction with herbs (think rosemary or mint), citrus (lemon, lime, or orange), cucumbers, or fruit (like melon or berries). Inspiration: For specific “self-flavored” water, see recipes here and here. Freeze up some fun flavored ice cubes and drop them into a tall glass for an afternoon pick me up. You can even make water seem more special by creating these lovely floral ice cubes and filling up a beautiful carafe with sweet glasses to match. Whether you’re in need of a beard for alcohol at the bar or just want a little something bubbly, mineral and sparkling water are great go-to beverages. Pour some in a glass with ice cubes, garnish with a slice of lime or a few green olives, and voila! A mocktail that won’t be mocking you tomorrow morning. Mineral water in particular contains minerals like calcium and magnesium, important for health, and is a great way to source these compounds without the fluoride and chlorine found in most municipal-sourced tap water. Inspiration: If you’re a little befuddled about spring vs. mineral vs. sparkling waters, check out this explanation of different bottled waters. 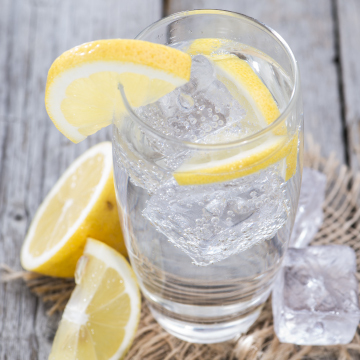 Our favorite mineral and sparkling waters are Gerolsteiner (for its super-high mineral content), and Pellegrino flavored waters (in lemon or lime), but any variety without added sugar or fruit juice works. A word of caution – read your labels, even with water! I would suggest looking into a good brewing method. I love cold-brewed coffee; it has far less acidity than heat brewing and is mellow and smooth. The other way I brew is in my Chemex. It has a thick filter that absorbs a lot of the oils that make coffee bitter and it produces a really clean cup. This is how I cold brew, this is how to use a Chemex. I get my beans from a local roaster and grind them at home (freshly ground is key! ), I like central American beans and I look for a ‘full city’ roast (lighter roasts don’t have enough flavor, darker gets burnt tasting). Finally, try adding a pinch of salt, ta rick I learned from Alton Brown. It can offset the bitterness the way that sugar does. And I love the coconut creamer from Following My Nose (recipe), I made it with melted cocoa butter instead of coconut oil so it has a sort of white chocolaty taste. Depending on which region of the world you come from, drinking tea can be social, ceremonial, ritual, spiritual, or medicinal. For many, a cup of tea is a comforting ritual after a long day, or a healthier substitute for those dessert cravings. All varieties – black, green, white, and herbal – are permitted on the Whole30. In my experience, if you brew hot tea and then just throw it in the fridge, you’re going to get cloudy iced tea. I double brew my tea, fill a pitcher with ice, then pour the hot tea into the pitcher. It chills it faster and you don’t get the cloudy tea phenomenon. We aren’t big fans of drinking your food, but we definitely approve of using vegetable juice as a nutritional supplement (and not a replacement for eating real vegetables), or as a tasty break from drinking water. Just make sure your concoctions are far more vegetable than fruit, and beware that even some vegetable-only drinks (like those heavy in beets and carrots) may pack more of a sugar punch than you’re willing to add to your day. You’ll probably have to juice it yourself (or use a blender of sorts), as most pre-packaged “vegetable juices” are mostly fruit. Read your labels, and do the sugar-math! This carrot-apple-mango juice looks vegetable-y, but has 33 grams of sugar in one bottle. Most people either love it or hate it, but kombucha has many redeeming health qualities, so if you’ve never tried it, now might be the perfect time. Our Director of Operations, Erin, didn’t love kombucha at first, but once she tried it off the tap at Whole Foods, she was hooked. Go for the unsweetnened types (flavored or unflavored – both are fine on your Whole30) or learn how to brew your own. Coconut water is another fine “treat,” even during your Whole30, although it’s naturally a bit too sugary to replace your everyday water consumption. Coconut water flavors vary tremendously by brand, so you may have to try a few before you find the one you like the best. We’re big fans of Taste Nirvana’s coconut water with pulp. If kombucha or coconut water aren’t what you’re craving, perhaps a lovely mug of bone broth will suit you. Though not your traditional cold weather drink, bone broth can be a savory, fortifying treat in those dark winter months. Use the recipe in It Starts With Food, or try this slow-cooker version from Nom Nom Paleo – make a big batch, freeze it in individual small-sized mason jars, and enjoy a cup a day with no preparation (but a little heating up). Finally, for the kiddos, our own Robin Strathdee notes that her little ones love “fizzy water” (especially the fruity flavors), watered-down coconut milk (from the can), fruit-flavored herbal teas, and water infused lightly with fruit juice. What are your favorite ways to quench your thirst Whole9 style? Share in the comments below… and cheers to your continued good health! great post! I’ve been wondering about sparkling waters so I’m glad you addressed that. Another online source for teas is Joy’s Teaspoon http://joysteaspoon.com/ My favorite flavor is Almond Cookie. There is no sweetener added but you’d never know it! I love that question…what can I have besides water. Part of our problem is that we want things that go in our mouths to be tasty instead of nourishing. These are good recommendations, ones hopefully people will choose instead of the more toxic alternatives like soda. Plus, the use of organic coffees is also on the rise and I’m finding many people prefer them. Thanks for the great article! This might sound cheesy, but I like to remind myself to be grateful, because for millions of people, having access to clean drinking water is a luxury that is unheard of. That makes me feel like a petulant first world toddler for complaining about “only being able to” drink water” when that ability is not a given in many parts of the world. Heather, thanks for sharing! We’re HUGE fans of tea, and love exploring new brands and flavors. Dr. Mark, you’re totally right. If you’re really used the supernormally stimulating taste of soda or Monster energy drinks, water is super boring in comparison! But it’s no different than preferring a Blooming Onion to grilled peppers and onions… change your food, and your tastes will change. Thanks for commenting! Cortney, I don’t think that sounds cheesy at all. We should all take time to be grateful for the things we have – including the financial means to purchase healthy foods, and the ability to drink healthy water any time we want. Thank you for sharing. Yay! I’m ever-so-happy to see kombucha on the list, we make our own and I wasn’t sure if it was “allowed” due to the added sugar. We give ours longer than the standard 10-14 day brew time, so it’s never sweet, but wasn’t sure that it would be true whole 30 compliant. Happy day! I’m thrilled you suggested drinking bone broth. My mom used to make broth every week. She would use it as a base for our daily soups. (We’d have a bowl fo soup to start off our dinner every night – “it warms up your tummy for the food you’re about about to eat” -she used to say). I personally dont’ take the time to make soups, so instead I just drink it out of my thermos while at work the way I would a cup of coffee. I’ve always felt like i’m a bit of a weirdo for doing that so i’m thrilled to see you suggest it. It is honestly absolutely delicious, satisfying, and oh so comforting. I love it and highly recommend it!! I just recently got into bone broth – after a year and a half of hearing about it I FINALLY made some. I thought it was going to be a pain in the rear to make, but it wasn’t! It is awesome. I just drink it straight in a mug. We have a great local grassfed meat store that has bones for super cheap. Throw em in the crock pot with some water and veggies and set the timer. Wait a day and voila… bone broth. My new favorite drink. Debbie, do you brew your own kombucha at home? What recipe do you like to use? Susie, I have also recently found the delicious goodness that is bone broth and am excited to receive the grassfed bones I ordered last week so we can make up a new batch just in time for the weather to get nice and crispy-cold. So glad to hear you attended the conference in Colorado. I’ve just been reading updates on the Nom Nom and Clothes Make the Girl websites. It looked wonderful! Best of luck on your Whole30! a refreshing change of pace is to add ginger juice ( I grate fresh ginger root in the food processor or blend the chopped root to pulp in high speed blender, with a little water, then strain out most of the pulp) and fresh lime juice to sparkling or still water. YUM! Nancy M, that sounds delicious! Thank you for sharing. I LOOOOVE tea and I can drink gallons of it :) Especially herbal teas, rooibos, honeybush, green tea… Recently discovered Kombucha and it was an instant love :) Planning to try to make my own at home. I really like the green tea/balm kombucha they make here in Czech Republic, I buy it for a great price directly from the company that makes it. Do you guys feel comfortable recommending online tea sites besides Adagio? Not that I don’t like them but want to try some other ones. Liz: I would recommend that you look for websites that have the ingredients of their teas listed on the site. For example, Yogi Teas (http://www.yogiproducts.com/) lists their ingredients at the bottom of each tea description (I found out the hard way that many of their teas include stevia). Teavana (http://www.teavana.com/) and Art of Tea (http://www.artoftea.com/) also list their ingredients online. Folks on our forum have also recommended Harney & Sons (http://www.harney.com/), but as far as I can tell, their ingredients are not listed on the site. Any recommendations about what to drink during long bike rides or runs? I haven’t started the whole30 yet but I’m just wondering what I can drink instead of my usual cytomax or ironman perform. Also, any substitute for powerbars or shot blocks? I eat Larabars on my long rides. And eat nuts. And bananas. I drink coconut water with pineapple. My partner and I stumbled over here from a different page and thought I might as well check things out. I like what I see so now i’m following you. Look forward to going over your web page for a second time. Is ok on Whole30?? This would make my year! I brewed my own but I love the kombucha at WF! Does anyone else get sinus pain or low grade headaches from drinking mineral water? Any ideas what could be the problem? Carbonation? Sulfates? Whatever it is, it’s really a bummer! @Kim: It’s interesting that you ask that. I’ve noticed that I get a headache after drinking certain brands of mineral waters (I never get headaches otherwise). I am allergic to sulfas so I am wondering if that’s the cause. Are you allergic as well? Do you always drink the same mineral water? If so, try switching to other brands and see if that does the trick. I’m not allergic to sulfas that I’m aware of, but I wouldn’t be surprised to add another allergy to the list! I have the problem when I drink Perrier and San Pellegrino, which frankly are the only brands I’ve tried! What brands have you had good luck with? @Kim, I’m able to drink the Whole Foods brand and Gerolsteiner. Maybe try a couple of different brands and see if any work for you. Thanks for the tips, Erin! Are almond and coconut milk (carton packaged) approved beverages? Can you recommend a brand of coconut milk? I’ve searched high and low and every brand I found has xanthum gum, carageenan, and/or guar gum in it. I’m assuming those ingredients are not okay. I’ve drank 5 bottles of GT’s flavored Kombucha because I read in this post that they are ok. I recently another in another Whole9 forum that I should have only been drinking the flavors with 2g of sugar. What do I do now? Shoul I restart my Whole30? Are they more specific guidelines as to which Kombucha brands to buy? It has nothing to do with how many grams of natural sugar are in a serving (where the heck did that info come from???) and everything to do with whether sugar is listed in the ingredients (meaning there is added sugar). Just read the label, and if sugar is listed as an INGREDIENT, stay away for your Whole30 (as we would say about any other food or drink). Most brands I’ve seen don’t have added sugar, but some of the fruitier or more complicated flavors might, so just check it out in the store before purchasing. Thank you for the clarification. The bit about Kombucha with more than 2g of sugar being non-compliant with the whole30 is from comment #15, from a moderator. (http://forum.whole9life.com/topic/4235-kombucha-vs-bacon/). Cheers! This means I won’t have to get rid of my GT’s inventory. So what do you say to flavored water or zero calorie sobe drinks with no sugars whatsoever? Or what about thre naked drinks? Of these ingredients, at least erythritol and stevia are non-compliant, which means that you can’t drink this on a Whole30. “Natural flavors” is also difficult, because it could have a non-compliant source. So what are some other caffeinated drinks you recommend besides the ones listed here? re there any bottled beverages or anything like that? @Hillary: Teas and coffee are your best bet for caffeinated drinks. If it’s in a bottle, it’s best just to check the label and make sure all ingredients are Whole30 compliant. You could also post your question on our free Whole30 forum. People there are great and chiming in about this kind of thing. i thought i could not have caffeine, on whole 30? i am on day 18 and been going without. Since you’ve made it 18 days, maybe you should just go for the entire 30 days? You’ve made it this far! I’m really late to the party here, but in regard to vegetable juicing: vegetable juices (primarily greens) are a wonderful drink and, when juiced with a masticating or centrifugal juicer made for that purpose, still provide a lot of fiber, live enzymes, and scads of nutrients. I’m about to embark on the Whole30, and while I don’t recommend fruit juicing or juicing veg with high sugar content, I think veg juicing at home or via Whole Foods (or at any Jamaican place, particularly in NYC) is just a great thing to do for your health. Fourteen years ago, I was diagnosed with fairly aggressive rheumatoid arthritis. My doctors were basically prepping me for life in a wheelchair. I started a daily regimen of veg juice (which I only do occasionally now) and my pain and mobility improved dramatically. Just needed to add that important note. I’m stoked for my Whole30! Are the La Croix drinks approved?? I love sparkling water and iced tea. Another thing I’ve been drinking a lot of is cucumber water…. Just thinly slice a fresh, firm cucumber and add a few cups of water… Let it steep in the fridge for a few hours and voila, a refreshing drink. Also, when you’re done steeping them in the water, you can dry them off a bit and add them to your salad. Marci, I was curious about La Croix too. I know it says “natural juices” or something but the can does say 0 g of sugar. Similar to the Hanson’s all natural sparkling water. Is dark chocolate flavored coconut water acceptable? I LOVE Zico brand dark chocolate but I’m not sure if it’s Whole30 approved..? we just love kombucha! but, i still find that a few brands are still high in sugar. we wanted an alternative for soft drinks for the kids but even though kombucha has great benefits, we didnt fancy the sugar content from the imported brands. So, im sure you guys do feel the same? i got introduced to ‘Kombucha Me’, this is one of the brands with lower sugar content (my kids doesnt like the strong kombucha, so slight tart is great for the little ones!) They do deliveries as well, which is great, so we generally stock up a few. We live in Sydney, but they mentioned they ship across Australia. hope this helps! quench your thirst with an alternative!